I have to admit that it saddens me that we are in 2014 and still need to lobby Australian politicians for something so blindingly obvious than a price on carbon but here we are. Coordinated by the World Wildlife Federation, today a letter signed by 59 economists (including myself) has been released. The text is below. We are writing this open letter as a group of concerned economists with a broad range of personal political views, but united in the judgment that a well-designed mechanism that puts a price and limit on carbon pollution is the most economically efficient way to reduce carbon emissions that cause global warming. • incorporation of the cost of the damages caused by carbon emissions into business decisions, by requiring companies to pay to pollute. The Intergovernmental Panel on Climate Change has made it clear that human influence, through activities such as accelerated and large scale burning of fossil fuels and clearing of forests, is warming the globe and that the impacts of climate change are being felt across the world. These findings are supported by the leading scientific bodies of the world, including the CSIRO and the Australian Academy of Science. Australia can and should do its fair share to contribute to global emissions cuts, which will require Australia to make significant and sustained reductions in emissions and transition to a low-carbon economy. Clear short-, medium- and long-term targets to limit emissions would guide expectations. It is important therefore to provide stable, long-term policy that can meet deeper cuts in the future, and that improves certainty for business and investors to begin an orderly transition to cleaner technology. We urge all Members of Parliament and Senators to work in the national interest towards lasting agreement on a fair, economically efficient and environmentally effective policy to price and limit carbon emissions. I put my name this week to a letter organised by the WWF on airline emissions. Basically, while, in general, I am in favour of markets that allow meaningful offsets of emissions I am concerned that, in this instance, they do not appropriately offset the emissions generated (as evidenced by the very low costs associated with emissions offsets on airline sites). The emission offsets themselves have to be priced into the market in an appropriate way or there is the possibility of abuse. Apparently, I am in good company being worried that the cost of carbon will not be reflected quickly enough with current proposals. As the ICAO Council and its technical committees develop the global market-based measure over the next few years, the biggest question they must face is at what level to price that risk. That is, how large an incentive is needed for economic agents to cut back on the production of emissions by an appropriate amount? The answer is that for all these agents—whether consumers, businesses, entrepreneurs, or investors—the level of the incentive should equal the expected present value of the discounted damages that may be created by the production of emissions. In other words, the right price for every amount of carbon emitted into the atmosphere should reflect the expected cost of these emissions to society as a whole, taking into account the risks that they create. Economists refer to this value as the social cost of carbon. Several reputable studies have attempted to calculate the social cost of carbon. The Stern Review estimated it to be about US$85 per metric ton of carbon dioxide emitted into the atmosphere. The recently revised official US government value is $37 per metric ton. Unfortunately, all available evidence suggests that many countries within ICAO and the aviation industry support a type of market-based measure, which would allow airlines to buy emissions offsets in order to meet an already weak 2020 carbon neutrality target. If ICAO adopts this approach, it would not bend the aviation industry’s total emissions downward and thus would fall short of being a meaningful policy. Such a market-based measure that fails to create appropriate incentives could set a bad precedent and would waste a significant opportunity to move the global climate response forward. Basically, there hasn’t been enough innovation in airlines to give us confidence as opposed to ensuring people substitute away from airline travel (especially for meetings) in the short and medium term. This post seeks to describe one particular concern with the implementation of the Australian Government’s Direct Action policy, as laid out in the recent Green Paper. There are many concerns with the Green Paper that have already been pointed out which, in the interests of space, I shall ignore. I wish to focus solely on the potential change in producer behaviour induced by Direct Action. I shall call this change in behaviour the supply-side response to the policy. Direct action works by providing incentives to producers to reduce their carbon dioxide equivalent (CO2-e) emissions; the Government will, through a reverse-auction tender process, pay companies for reducing their emissions beneath their historical emissions levels. This causes firms to face an effective marginal cost for emissions, when they are operating beneath their baseline emissions levels (the direct action plan will not include penalties for firms that exceed their historical emissions levels). Some media coverage has been worried that the lack of upside penalties means that firms won’t make any emissions reductions. This seems backwards, as it implies that firms will leave cash on the table. The effect of using a reverse-auction tender process will be to pay firms more than the actual cost of their emissions reductions. If the tender process uses a second price approach (so that all firms will be paid at the rate of the most expensive reductions contracted for at that auction) then this conclusion is straightforward. Even in a first price auction (each firm is paid what they bid) the conclusion is still valid – in equilibrium, firms will bump up their asking prices above actual emissions reduction costs. This implies that firms (and industries) who make emissions reductions are being subsidized relative to the rest of the economy. It is unclear, given the contents of the green paper, what the relationship between quantity of production and the size of subsidy will be. The exact accounting mechanism used for changes in production and new entrants will be critical in determining this relationship. This point should be obvious to anyone who has thought about how to design carbon pollution abatement schemes, and seems to be understood in the green paper. A more subtle point is that, in a dynamic world, even if changes in production and new entrants are accounted for in a manner which does not distort incentives the mere existence of a direct action plan, and associated subsidies, will increase production levels in high emissions intensity industries. To understand why this is true, consider a simplified scenario in which a firm that reduces emissions is paid a for the costs of these reductions, plus an annual lump sum payment (to a first approximation, this is what a well-designed direct action scheme will achieve). Under a CPRS or carbon tax, some high emissions intensity firms would shut down due to the higher costs. These shutdowns may not occur under the direct action scheme because the annual lump sum payment will decrease the firm’s average variable costs and affect the shut down decision. The direct action plan will see less reallocation of resources from high emissions intensity sectors to low emissions intensity sectors. Furthermore, the annual lump sum payment can influence future investment decisions by changing relative rates of returns between industries. In a competitive environment we would expect, in the long run, rates of returns to be equalized across industries; externally induced changes in rates of return can lead to changes in resource allocations between industries. It is natural to ask “how much effect will the supply response have on emissions levels?” This is a very difficult question to answer. A paper published by ABARE (now ABARES) in 2010 tried to estimate the supply response effect for the agriculture industry [disclosure – I am the lead author of the ABARE paper]. The paper made use of a computable general equilibrium model, developed by ABARE and Treasury, called the Global Trade and Environment Model (GTEM) which embeds many assumptions (see the paper for details). The key graph in the paper is figure d on page 24. 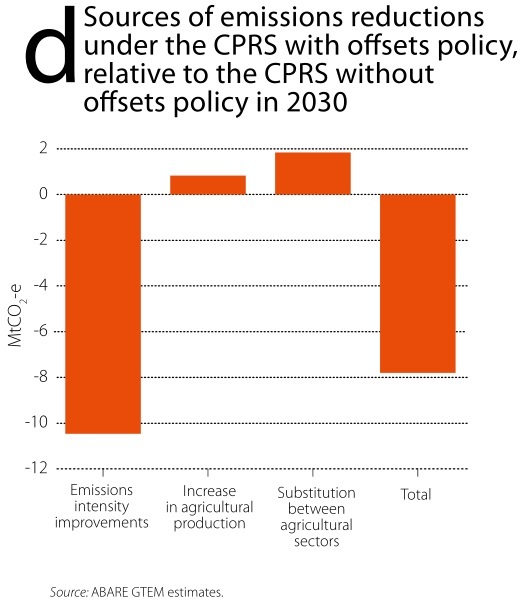 This graph demonstrates that, by 2030, applying an emissions offsets scheme to agriculture (the emissions offsets scheme modelled is roughly comparable to the Government’s Direct Action policy) would have reduced Australian agricultural emissions by almost 8 million tonnes of CO2-e, relative to 2030 emissions without any specific emissions reduction policies for agriculture. However, this 8 Mt conceals the fact that agriculture would have made efficiency improvements equivalent to a reduction of over 10 Mt of CO2-e. The difference between these two numbers (2.6 Mt of CO2-e, or roughly 25% of the efficiency improvements) is the effect of the supply response caused by subsidies to the agricultural industry. The subsidy causes overall agricultural production to increase and causes a substitution away from low emissions intensity cropping to high emissions intensity beef cattle and dairy production. To put it another way, you need to pay for 10 million tonnes of `direct action’ to get 8 million tonnes of emissions reductions. Note that these figures are specific to agriculture, and depend on a specific set of modelling assumptions. Even when viewed in context, these numbers are best thought of as an educated best guess rather than a pinpoint prediction. The supply response effect of the Direct Action plan could be bigger, or smaller, than the 25% estimated by ABARE for the agricultural sectors. I don’t know the answer to the question “how much effect will the supply response have on emissions levels?” But I do know that the Government (in particular, ABARES and Treasury) have the expertise to try and answer this question, and that knowing the answer is crucial for designing an effective Direct Action policy. Bushfires and climate change: where’s the policy? Ahh, Greg Hunt has got himself into a pickle by quoting Wikipedia on the causes of Australian bushfires. This amused me greatly and I wanted to write a post making even more fun of it. Sadly, I did what I am not expected to do as a blogger and listened to the whole BBC interview that caused this. Nothing takes the wind out of a blogger’s sails than context. Bushfires in Australia are frequently occurring events during the hotter months of the year due to Australia’s mostly hot, dry climate. Large areas of land are ravaged every year by bushfires, which also cause property damage and loss of life. Damn. That doesn’t look like a wrong statement and those of us in academia would pretty much agree that is the standard way to open a discussion on bushfires. Hunt then went on to say that he did not think it was relevant right now whether to determine whether the current fire was caused by climate change or not. He said we need to deal with the crisis and then the longer-term policy later in which he did not dispute that climate change may be cause of the increase the frequency of bushfires. The science is pretty clear that there has been an increase in that frequency whether it has been caused by climate change or not. The BBC interview had a scientist on after Hunt that said pretty much just that. Now the Greens and others would like to use this event as a motive for continuing to act on climate change. I think that is a legitimate avenue to push. Abbott and Hunt clearly, for similar political reasons, don’t want to allow the debate to go there. But I think we need to step back and consider this more dispassionately and I am worried that bringing the climate change equation into this will actually undermine action on a clear policy issue. First, having now spent 4 years in North America, let me tell you that the Coalition have come a long way on environmental issues. Importantly, they now accept environmental damage is a bad thing. This is not true of the right-wing elsewhere who don’t necessarily care what happens to the environment. The issue in Australia now is how to get a clean environment not whether to have one. This is a big change from when I was growing up. Clearly, the Coalition are not acting on carbon pollution in a way that is effective or cheap but that is another matter. Second, the climate change equation is irrelevant to how we manage bushfires. You can have a carbon tax in Australia or world-wide and the increased frequency of bushfires will remain a problem for a century or more. Mitigating climate change is not a solution to this. It would be best that we kept it separate. Third, that means we need to focus on bushfire management strategy. Four years ago 176 people perished in the Victorian bushfires. Now I don’t know what was done after that in policy circles. As a blogger, I will exercise my expected charge not to bother to find out. But the NSW situation should at least put on the table that it isn’t enough. We have state-wide situations in October for goodness sake. How did this happen? As I read the media today, I see column inches and web pages devoted to climate change and the politics of that and nothing devoted to the clearly central policy issue raised by the current crisis. While they may have political motives, what Hunt said was actually more consistent with focussing on the relevant issues than what many others seem to be doing. In social media, we need to get the focus back on the real issue. Bushfires are a problem. They require a solution regardless of causes. The rate of return for investment in this is likely to be very high. Do something. Author Joshua GansPosted on October 25, 2013 Categories Environment9 Comments on Bushfires and climate change: where’s the policy? Author Joshua GansPosted on August 10, 2012 Categories Environment6 Comments on A carbon price on green energy? Now I know what you are thinking. You are thinking that I should just let this go. You are thinking that it was actually Australian economists who educated Labor on the value of “market-based mechanisms” to control climate change. That when we did so, we had the overwhelming support of the Liberal party. And so it is hardly the case that Labor is duping economists. And I know you are thinking that I had it right a year or so ago when I cast the Opposition leader as a market-hater. Why would I need to say such things again? And surely it goes without saying that in the choice of a carbon price rather than direct action there is not one single economist in Australia who has advocated direct action. I mean we know Tony Abbott knows that and what conclusion he draws from it. And I know what you are thinking, if you read Abbott’s full speech it really is a broadside against government creation of a market and the notion that it just can’t be done because ‘you can’t sell air.’ And I know that you are thinking that he doesn’t understand that a carbon permit is just a financial instrument or that measuring emissions for the purpose of taxation is just as hard an accounting exercise as measuring firm profit for company tax. And that we would draw the conclusion that he wants to give up entirely on these government facilitated markets too. Yes, you are thinking all of those things as you read this post and that I, for one, should just let it go. But I just can’t so I’m going to say it. Wait for it. OK, here it is. It may well be that the Opposition leader truly thinks that direct action is the way to go. So maybe that’s a comment on the quality of our Opposition leaders.